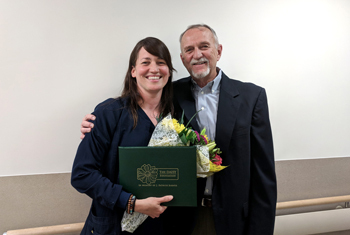 Nurses at Beebe Healthcare are being honored with The DAISY Award, a part of the DAISY Foundation’s national program to recognize the super-human efforts nurses make every day. Beebe’s June recipient is Anne Villalobos, a non-invasive cardiology nurse, who was recognized for the compassionate care she provided to a patient, Mr. Peter Goobic. Beebe presents the DAISY Award to nurses on a quarterly basis. Mr. Goobic arrived at the hospital for a scheduled stress test and was very concerned about the outcome. “Anne immediately put me at ease,” Mr. Goobic wrote in his nomination. “She thoroughly explained the process of the stress test and answered all my questions… We talked about family, parents, grandchildren, and her training, and exchanged funny stories. Anne also gave me good advice on living a healthier life. She laughed at my jokes. Can it get better than that? Anne was presented with a DAISY Award certificate and a hand-carved Healer’s Touch sculpture during a recent surprise ceremony. Each DAISY honoree receives the statue and the certificate, which commends the honoree for being an "Extraordinary Nurse." It reads: "In deep appreciation of all you do, who you are, and the incredibly meaningful difference you make in the lives of so many people." The not-for-profit DAISY Foundation is based in Glen Ellen, Calif., and was established by family members in memory of J. Patrick Barnes. Patrick died at the age of 33 in 1999 from complications of Idiopathic Thrombocytopenic Purpura (ITP), a little known but not uncommon auto-immune disease. The care Patrick and his family received from nurses while he was ill inspired this unique means of thanking nurses for making a profound difference in the lives of their patients and patient families. Nurses may be nominated by patients, families, and colleagues, and they are chosen by a committee of nurses at Beebe Healthcare to receive The DAISY Award. Awards are given throughout the year at presentations given in front of the nurse’s colleagues, physicians, patients, and visitors. To nominate a Beebe nurse for the DAISY Award, please visit www.beebehealthcare.org/forms/daisy-award. For a complete listing of healthcare organizations currently running the program, visit www.daisyfoundation.org. Caption: Shown are Anne Villalobos, RN and Mr. Peter Goobic.